Are Brooks saddles really that comfortable? Discussion in 'Beginners' started by Bigtallfatbloke, 8 Jul 2007. On htis site they have one that they claim is pre broken in...sounds good but is it? I have 4 weeks to go before I tour...can it be broken in in time...maybe I should jus tget one and see? ,,but should I get a B17, a B17 ready worn in, B72 light weight touring also sounds good to me. I read a review that said they can be broken in after about 150miles is that true? Do they deed any special stem fittings ...I am clueless...I have a daws galaxy 2007...should fit right? Personally I get on much better with my B17 than anything else. Did my second tour on an expensive semi-hard jobbie with gel bits places and ergo cut-outs. I found it really comfy on training rides of up to 60 miles, so I thought it would be fine..... it wasn't! My rear was cut to shreds after two weeks of 100 miles a day. Used a B17 since then and found it far less painful. It did take a few rides to acclimatise, not sure what gets broken in the saddle or you. The B17 isn't that expensive for a saddle, try it and see. Just noticed what you wrote below the picture. The B17 has a fairly standard pair of rails, so no special fixings required and it will fit you Galaxy. Only thing I found is that the rails are a long way apart at the back and I couldn't fit my Topeak seat pack to them. The people that I've talked with and seen in print on other forums all say that they would not change from their Brooks saddles, so I would say you are on a winner if you buy one. As I understand it the saddle needs to shape up for your bottom so getting a new one then putting in the miles seems to be the way to go!!!!!!!!!!!!!!!!!!!!!! I have two; one was comfortable right out the box, the other took a good while (hundreds of miles) before it felt OK. I did a bit of `damage` to my sit bone area, still a bit tender 4 tears on camping/touring holiday on a saddle that was not the best for the distances and road surfaces I covered). I bought a B67 and the comfort and relief were fantastic - straight out of the box- and its just got better since. It took a bit of faffing about to get it set up so that I didn`t get `numb bits` and it paid off, I can spend all day in the saddle and not a single twinge (unlike the office swivel chair I,m sitting on at the moment. Three years use has seen the surface stay firm and the indentation seems to be fine (took about a weeks use at 10 miles per day to get the indentation showing). Some might think it looks a bit ugly but I love it to bits . ...thanks for chiming in chaps...i appreciate your comments. Should I get one the claims to be already worn in (bit more costly) or wear it in myself and suffer the pain? Inotice there is a standard shape and a narrow shape B17...which do i need? Narrow sounds...erm...painful to me but what do i know. Are those springs on the pic above and the B72 light weight tourer saddle worth the extra weight do you think? 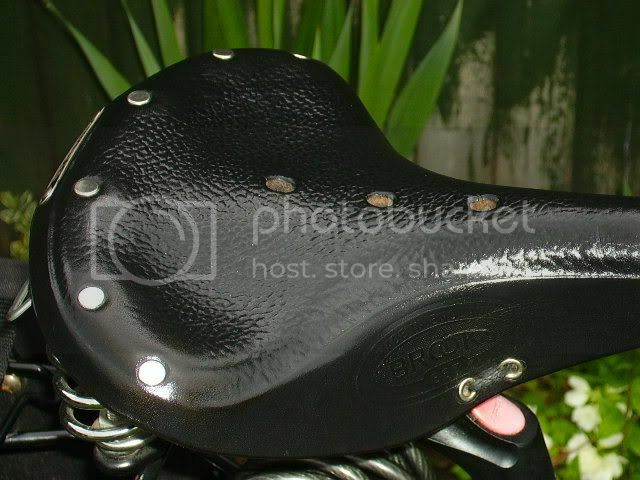 Saddle size depends on the distance apart that your sit bones are, and no - I don`t know of a way that you can measure them yourself (unless you could find a block of that semi-dense foam that will retain an imprint of your bare bum long enough to measure the deepest indents). The springs only seem to remove the `buzz` from coarse road surfaces (I only weigh about 8 1/2 to 9 stones so I certainly don`t get any bobbing up and down). I doubt that a B72 could be classed as lightweight in any class , but it`s not much compared to the total weight of junk/ luggage/accessories that I tend to clutter the bike up with . I wouldnt bother with the pre broken in one, my b17 special was very comfortable from the box and shaped to me after the first couple decent rides. f you are a big fella BTFB, then its the seat fro you. Brooks B17s are great. Mine was comfortable from the word go (at least, it was once I'd set it up properly). The San Marco Rolls is also very good. Congratulations to you both. I hope you have a long and happy marriage. I take back what I said about them not being that expensive! Didn't realise it would set you back that much, I think mine was about half that.